The aviation industry appears to be entering a golden age for new pilots as we continue into the New Year. The generous compensation and retention programs of airlines such as Endeavor Air, a subsidiary of Delta Air Lines that flies as Delta Connection, are evidence of this positive trend. The airline recently announced that it is beginning an $80,000 Pilot Retention Payment program to attract the best and brightest to its cockpits. With pilots earning more of the compensation, downtime and respect they deserve, it is an excellent time to enter this critical and esteemed profession – if you have what it takes. Endeavor Air, which describes itself as evoking “an image of innovation, excitement and the adventure of a journey,” will now provide pilots hired between 2015 and 2018 the opportunity to earn $20,000 in retention payments per year for the first four years of employment – that’s up to $80,000 just in bonus compensation! This generous opportunity comes in addition to the company’s competitive compensation package. Endeavor Air states that new pilots will earn $44,000 in their first year thanks to this new bonus, and their earnings will go up each year with a fourth year salary totaling over $80,000. If you’re looking for even more incentive, Endeavor pilots are also given up to 15 days off every month to relax or earn additional income, and have the opportunity to take as many as 35 days of vacation throughout the year. New hires aren’t the only ones with an opportunity to earn additional compensation at the airline, though. 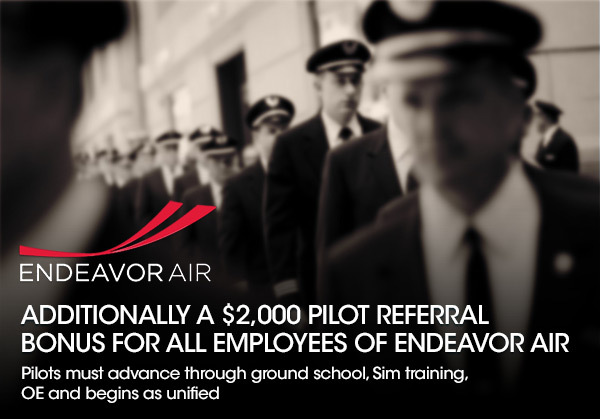 All current Endeavor pilots will have an opportunity to earn $2,000 for each new pilot they refer who successfully finishes the airline’s training program and joins the team. Completing a flight training program, such as Coast Flight’s Airline Career Training (ACT) program, puts new pilots in an excellent position. There’s no denying that the airline industry is facing a shortage of pilots, and airlines like Endeavor are clearly in need of skilled new aviators to join their ranks. This pioneering retention program may be the most generous in the nation for regional pilots, but it isn’t the only one of its kind being offered at the moment. Other regional airlines such as Envoy Air, GoJet Airlines and Silver Airways have also announced signing bonuses ranging from $5,000 to $12,000 for new pilots. With regional airlines going out of their way to attract new pilots, it looks like 2015 is an excellent time to begin training for a career in aviation. Contact Coast Flight to learn more. Airlines will continue to add incentives to an aviation career as the 2015 Pilot Shortage shows no sign of slowing down.